General design of our project has been architected; thus it is the time to learn more about the individual parts of the big picture. Here are the detailed descriptions of our planned BioBricks of this year’s project, the mechanisms of how they conduct and what is expected from them exactly. We intend to add several HREs to the upstream region of weak constitutive promoter, PminiCMV, in order to design a novel hypoxia inducible promoter. We expect that in normal conditions with enough oxygen presence, PminiCMV promoter will express very small amount of mRNA which will be degraded soon conceivably. However, in hypoxic conditions, more transcription factors will hopefully bind to our designed HRE sites to enhance the transcription rate of PminiCMV promoter. 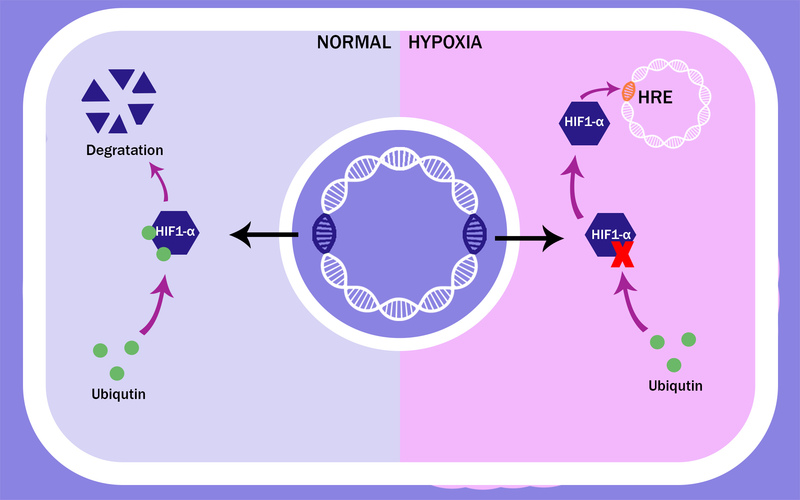 According to the studies in the literature, HRE sequence has provided significant high transcription rate in hypoxic cells when it was attached on the upstream region of Simian virus 40 (SV40) promoter. (Tang et al. 2002) In this study, plasmids which contain HRE inducible promoters were presented in cell lines and the amount of these plasmids were increased gradually to test whether the detection level and transcription rate of hypoxia would raise. As a result, the production rate of reporter gene attached to HRE promoters increased 410 times more. This result encouraged us to use these sequences as novel, efficient and powerful hypoxic promoters in human cells. The second mechanism includes a few understructure elements called TetR-VP16 complex and two different plasmids, pTet-off and pTRE vectors. In pTet-off plasmid, PCMV constitutive promoter with medium strength codes TetR-VP16 protein complex which can bind its respond element present in second plasmid, pTRE. Tetracyclin respond element (TetRE) is a protein binding domain which allows the binding of TetR component of the protein complex. Whereas, VP16 component works as a transcription activator for the weak constitutive promoter (PminiCMV) existing in pTRE vector. TetR-VP16 protein complex can activate this weak promoter in pTRE vector. We aim to insert an additional peptide called oxygen dependent degradation domain (ODD domain) between TetR and VP16 components. 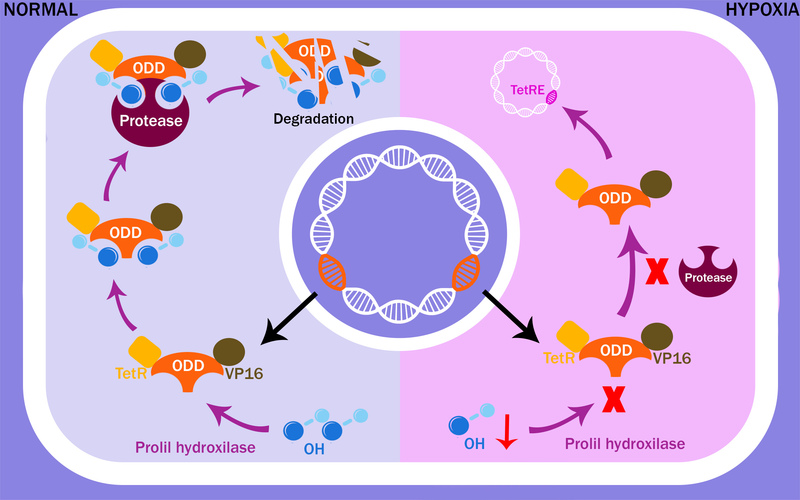 With this mechanism, TetR-ODD-VP16 complex can only initiate the transcription of only weak promoter in hypoxic conditions because of the degradation of the complex by proteasome in oxygen presence. ith this, protein complex is expected to behave like a hypoxia inducer. In hypoxic conditions, hydroxyl subgroups cannot be added to ODD domain which results as the survival and accumulation of peptide and the components (TetR and VP16) cohesive to it. Glutathione (GSH) is a peptide consisting of three amino acid residues, glutamate, cysteine and glycine, respectively. It is a natural cellular component for preventing damage to organelles caused by reactive oxygen species, free radicals or peroxides. GPx and SOD enzyme complex, converts free radicals and reactive oxygen species (ROS) into water. Also known as pancreatic trypsin inhibitor or serine protease inhibitor, aprotinin is a potent protease inhibitor. According to our researches, aprotinin prevents the formation of xanthine oxidase (XO) from xanthine dehydrogenase (XDH). 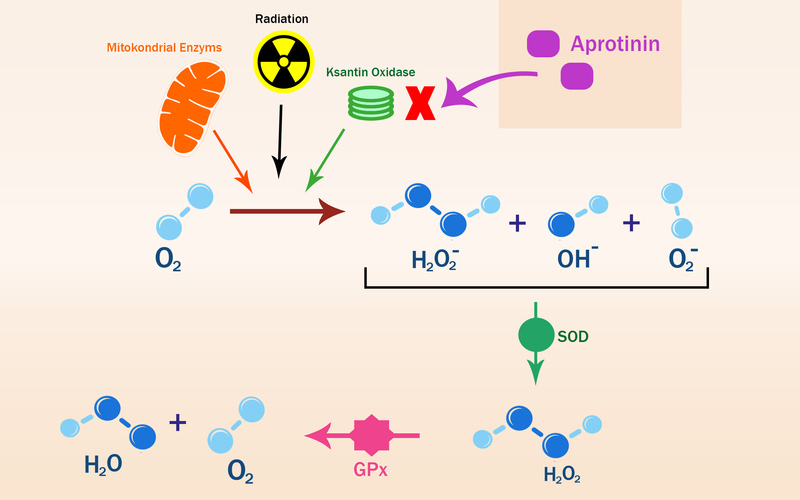 XO catalyzes the end step of xanthine degradation pathway resulting with ROS formation. In fact, about 80% of ROS during oxidative stress is produced by this enzyme. Furthermore, harmful free radicals such as peroxynitrite can be built up owing to the products of XO. Such free radicals have been found to react with DNA, proteins, and cells, causing cellular damage or even toxicity. Another reaction catalyzed by xanthine oxidase is the decomposition of S-Nitrosothiols (RSNO), a reactive nitrogen species, to nitric oxide (NO), which reacts with a superoxide anion to form peroxynitrite under aerobic conditions, additionally.This enzyme catalyzes the oxidation of hypoxanthine to xanthine and can further catalyze the oxidation of xanthine to uric acid. Both XO and XDH enzymes play an important role in the catabolism of purines. After removing the clot, we need an additional sensor system to compensate the hypoxia response elements transcription rates for antioxidant enzymes and proteins. Thus, we targeted to sense the ROS presence to conduct an efficient and swift solution. 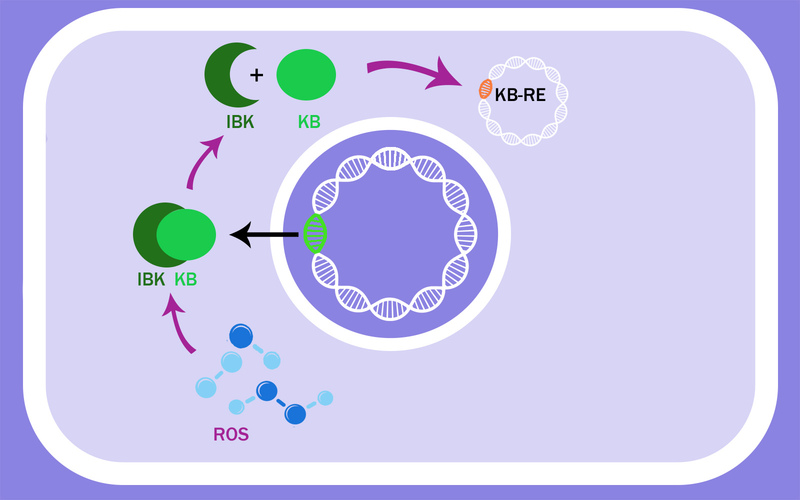 Nuclear factor kappa-B (NF-kB) is a transcription factor complex of hypoxia inducible factor-1 alfa (HIF-1α) protein, which consists of two subunits, p50 and p65. This peptide is detained in cytoplasm by a complementary peptide called IkB. (Kabe et al. 2005) This detention prevents the activation of related promoter sequence existing in the cell nucleus which is named kappa-B response element (kB-RE). It is later described that one of these stimulants is the presence of ROS. (Bonello et al. 2007) We want to use this advantage to design a novel ROS inducible promoter in human cells in iGEM to be able to sense oxidative stress. As a full designed system, we aim to combine our parts to gain maximum efficiency and robustness. We can categorize our parts into two classes: sensor genes and activist proteins. HRE, ODD and kB-RE parts are sensor genes to detect hypoxia and ROS presence, respectively. As we predict that the yield of our activist proteins must continue constitutively to conduct a successful treatment, we want to combine our all activist proteins with our sensor genes. Click Here to read about the summary of our parts and respective part numbers. •	Semenza G.L., Wang G.L. 1992. “A Nuclear Factor Induced by Hypoxia via De Novo Protein Synthesis Binds to the Human Erythropoietin Gene Enhancer at a Site Required for Transcriptional Activation”, Molecular and Cellular Biology, 12(12), 5447-5454. •	Tang Y., Jackson M. Qian K. Ian Phillips M. 2002, “Hypoxia Inducible Double Plasmid System for Myocardial Ischemia Gene Therapy”, Hypertension, 39, 695-698. •	In literature, a similar approach has been conducted successfully by inserting ODD into GAL4-p65 protein complex to induce a hypoxia-driven expression in human cells. (Tang et al. 2005; Fomicheva et al. 2008) We want to re-design this approach and implement it into our plasmid constructs to carry out a maximum capacity hypoxia-driven treatment system. •	Huang, L.E., Gu,J. Schau M. Bunn, H.F. 1998. “Regulation of hypoxia-inducible factor 1alpha is mediated by an O2-dependent degradation domain via the ubiquitin-proteasome pathway”, Proc Natl Acad Sci USA, 95, 7987–7992. •	Tang Y.L., Tang Y. Zhang Y.C. Agarwal A. Kasahara H. Qian K. Shen L. Phillips M.I. 2005. “A hypoxia-inducible vigilant vector system for activating therapeutic genes in ischemia”, Gene Therapy, 12, 1163-1170. •	Fomicheva E.V., Turner I.I. Edwards T.G. Hoff J. Arden E. D’Alecy L.G.D. Metzger J.M. 2008. “Double Oxygen–sensing Vector System for Robust Hypoxia/Ischemia-regulated Gene Induction in Cardiac Muscle In Vitro and In Vivo”, Molecular Therapy”, 16(9), 1594-1601. •	IUBMB Enzyme Nomenclature. “t-Plasminogen Activator”, http://www.chem.qmul.ac.uk/iubmb/enzyme/EC3/4/21/68.html, last reviewed: 1992. •	MetaCyc, “t-Plasminogen Activator”, http://www.metacyc.org/META/NEW-IMAGE?type=EC-NUMBER&object=EC-3.4.21.68, last reviewed: 26 August 2014. •	Pennica D., Holmes W.E, Kohr W.J. Harkins R.N. Vehar G.A. Ward C.A. Bennett W.F. Yelverton E. Seeburg P.H. Heyneker H.L. Goeddel D.V. Collen D. 1983. “Cloning and expression of human tissue-type plasminogen activator cDNA in E. Coli”.Nature, 301, 214–221. •	Van de Werf F, Bergmann S.R. Fox K.A.A. de Geest H. Hoyng C.F. Sobel B.E. Collen D. 1984. 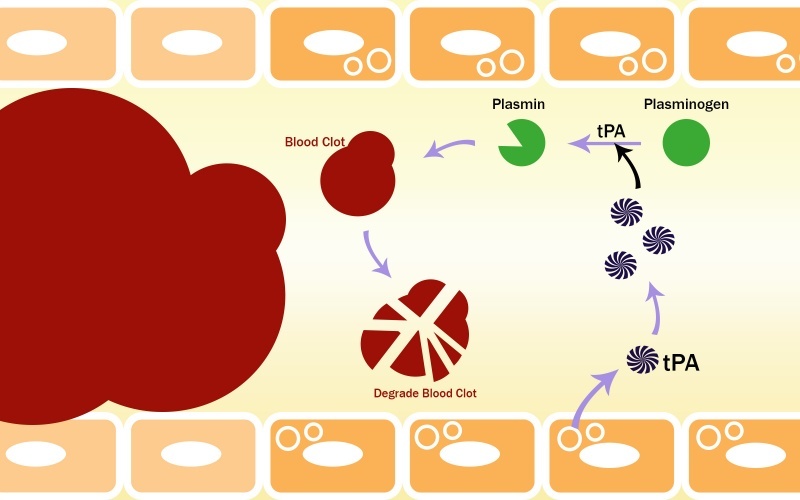 “Coronary thrombolysis with intravenously administered human tissue-type plasminogen activator produced by recombinant DNA technology”, Circulation. 69, 605–610. •	Battelli M.G., Corte E.D. Stirpe F. 1972. “Xanthine oxidase type D (dehydrogenase) in the intestine and other organs of the rat” Biochem J, 126, 747-749. •	Baudry, M., Etienne S. Bruce A. Palucki M. Jacobsen E. Malfroy B. 1993. “Salen-manganese complexes are superoxide dismutase-mimics”, Biochem. Biophys. Res. Commun. 19, 964–968. •	Gonzalez P.K., Zhuang J. Doctrow S.R. Malfory B. Benson P.F. Menconi M.J. Fink M.P. 1995, “EUK-8, a synthetic superoxide dismutase and catalase mimetic, ameliorates acute lung injury in endotoxemic swine.”, J. Pharmacol. Exp. Ther. 275, 798–806. •	Doctrow S.R., Huffman K. Marcus C.B. Musleh W. Bruce A. Baudry M. Malfroy B. 1996. in Antioxidants in Disease Mechanisms and Therapeutic Strategies, ed. Sies, H. (Academic, New York), 247–269. •	Shuvaev V.V., Han J, Tliba S, Arguiri E, Christofidou-Solomidou M, Ramirez SH, Dykstra H, Persidsky Y, Atochin DN, Huang PL, Muzykantov VR. 2013. “Anti-inflammatory effect of targeted delivery of SOD to endothelium: mechanism, synergism with NO donors and protective effects in vitro and in vivo”. PLoS One, 8(10), p. e77002. •	Kabe Y., Ando K. Hirao S. Yoshida M. Handa H. 2005. “Redox regulation of NF-kappaB activation: distinct redox regulation between the cytoplasm and the nucleus”, Antioxid Redox Signal. 7, 395– 403. •	Gilmore T.D., 2006. "Introduction to NF-κB: players, pathways, perspectives", Oncogene, 25(51), 6680–6684. •	Bonello S., Zähringer C. BelAiba R.S. Djordjevic T. Hess J. Michiels C. Kietzmann T. Görlach A. 2007. “Reactive Oxygen Species Activate the HIF-1a Promoter Via a Functional NFkB Site”, Jornal of the American Heart Association, 27, 655-761.